Vijay is donning the lead role in an untitled film directed by Atlee. Samantha and Amy Jackson are the heroines of the film. Radhika Sarathkumar and veteran director Mahendran are donning important roles. The shooting of the film commenced recently and is going on in rapid pace. 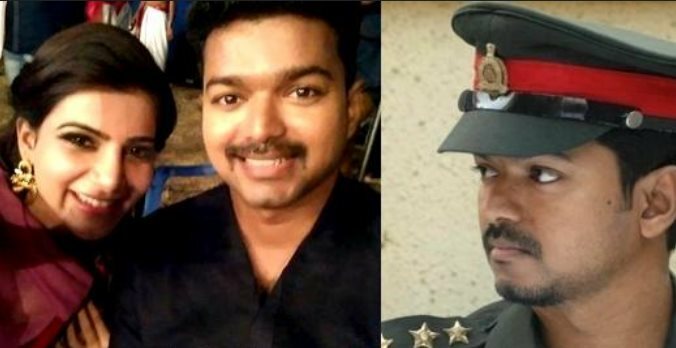 Vijay is donning the role of a police officer. Hence it was decided to title the film Moondru Mugam which was a yester year hit film which had Rajinikanth in triple roles. They were unable to acquire this title. So various titles were considered and finally it is understood that the title Khaki was chosen. Few years back Sarathkumar donned the lead role in a film titled Khaki but the film was dropped. Hence it is expected that the film will be titled Khaki.